You need to know when you need to request the services of a plumbing contractor. Whenever you face major plumbing problems, there is need to hire a certified plumbing contractor. 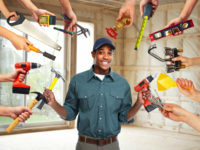 Plumbing contractors are more efficient and are more skilled with better resources in terms of knowledge, techniques and equipment than your general handyman.In case you come across common problems such as a leaky tap or congested drains, then you may want to consider hiring a plumber to get rid of any such a problem. On the other hand, if you want to install brand-new plumbing solutions or get some major remodeling work done, then you should also request the services a resourceful plumbing contractor. There are specific situations when there is the need for a complete service provider and their services will certainly prove more effective long-term and reduce the hassle. 1) In case there is a major plumbing issue: For example, the entire drainage system of your home has been clogged. To fix the problem you may need to get in touch with a plumbing contractor who along with the team that has a variety of equipment that will quickly find a solution and decongest your drainage pipes. 2) In case of construction, remodel or a new building: To install a complete plumbing solution in a newly constructed building requires a lot of effort, planning, techniques and experience. In many cases, it's already been set as an important part of architectural planning. So, if you want to have a long-lasting solution in your building of home that will keep working flawlessly for years, you need to hire a plumber from an efficient plumbing service provider to do the best work. 3) To quickly handle emergency situations: Many emergency situations may pop-up which the typical homeowner does not know how to handle. In such a case, a fast remedy is required, and a plumbing contractor would be your best choice. Take for example water uncontrollably running out of your faucet and toilets start flooding the house. In this case, if you do not take an immediate action then the inside of your house can soon turn into a swimming pool, that would be a bad situation leading to great damage, mold and costly repairs. There are several benefits of hiring expert plumbing contractors. There are so many related issues that cannot be taken lightly and need immediate and quick attention. Plumbing is not an easy-going task, and this will be proved when you hire the licensed Plumbing Contractors in Brooklyn to resolve your problems in a quick and effective manner.